According to Chris Horner of the Competitive Enterprise Institute, three out of the four main temperature data sets in the world are irrevocably corrupted or even fabricated. And NASA’s data set can’t really be used because they took their data from CRU (East Anglia), where this whole Climategate mess began. Not only that, there has been significant collusion between climate scientists and reporters to keep the alarmist message on track. Heck, it’s being argued that NASA themselves knew their data was poor, but did they tell us that? Pajamas has a few good articles on this. We also see Lord Monckton having a go at the Nature editorial staff, too. Here’s a neat video, too. Even some who bought the man-made global warming line must surely be having doubts as to whether to rush in gigantic climate taxes. 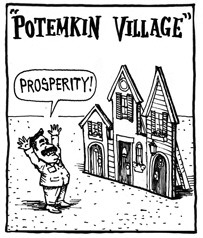 First a little background, the term “Potemkin village”, refers to Catherine the Greats tour of her lands, when her royal favourite Field Marshal Potemkin constructed fake thriving towns along her route of travel. Heres a Wiki. Fast forward a few hundred years and it appears parts of the UK think it was a great idea. According to the story the council has a large number of shop fronts empty due to lack of businesses to run them. Now call me old fashioned but I would have thought the priority for the council would have been attempting to provide a pro-business environment, maybe something as radical as offering a 5 year holiday on council rates, free advertising, rents paid for you for 6 months, or a number of other forms of assistance for real businesses. But no, whats better than that? Fake shopfronts. Fake bloody shopfronts, Jesus wept, the best a group of councilors could come up with in response to an economic crisis is the North Korean solution. Where was the councillor who stood up and said “You know, now I think about it, this really is an incredibly stupid idea”. Fake shops for fake people? Well if pedestrian traffic drops a bit more in those areas perhaps they should use the same wonderous logic and place mannequins in the street to simulate people? Or off er fake money to spend at the fake shops? Seriously, just when you think youve seen the stupidest ideas possible something like this comes along and lowers the bar even further.